When people sit for long periods of time the muscles burn less fat and the blood does not flow evenly. This allows more fatty acids to clog the heart. Which is why prolonged sitting is linked to elevated cholesterol and high blood pressure. A recent study showed that people with more sedentary time are more than twice as likely to have heart disease than people with less. Dr. James Lee from Austin Chiropractic has seen many of his patients lower their cholesterol counts when they get up and move around more while at their sitting job. Dr. Lee puts together a “chair-sitting-stretch” package for all his sedentary patients. The pancreas produces the hormone called insulin, which carries glucose to cells for energy. But when you don’t move for long periods of time then your muscles become idle and these cells don’t respond as readily to insulin, therefore the pancreas over produces insulin, which can lead to diabetes and other health problems. A study done in 2011 discovered that after just one day of prolonged sitting there was a significant decline in insulin response. When you remain still for too long, your body does not produce the natural antioxidants that kill cancer causing free radicles. Also that wen you remain still the increase in insulin encourages cell growth. All of these factors are leading causes of cancer. Dr. James Lee worked with many cancer patients in Arizona, specializing in raw food diets. All of the weight-bearing activities such as walking and running help to stimulate hip and lower-body bones to grow thicker, denser and stronger. There have been many studies recently that have linked lack of activity and movement increases your chances for osteoporosis significantly. The spine needs to have its natural curves. So when we slump because we are sitting to long then our abdominal muscles and back muscles goes unused and weakens, the neck as well. 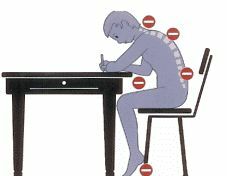 When we sit to long and extend our head foreword then our neck and shoulder muscles weaken. Also, our disks lose their spongy characteristic, become uneven and begin to recruit tendons and ligaments around the area for support. The collagen hardens as well. There is also a greater risk for herniated lumbar disks when you sit to long say Dr. James Lee from Austin Chiropractic. “Our bodies weight should be distributed along the arches of our spine, however, when certain muscles in the abdominal tighten, specifically the psoas, then our upper lumbar spine is pulled forewor and the majority of our weight is put on the ischia tuberosity.” Once your spine becomes inflexible you become very susceptible to damage during any type of activity. Therefore, an individuals level of flexibility is directly related to their health, if you are not flexible then chances are that you are unhealthy and visa versa. Your hips are part of the problem and solution as well as your gluteus muscles. When you sit for long periods of time your hip flexor muscles become short and tight and your gluteus muscles soften and reduce your stability. This will limit the range of motion and stride length of the hips and reduce your ability to “push off” with your legs. The chronic sitter must extend their legs in front of them more occasionally, which will extend their hip flexor muscles. Vein problems: Blood circulation to the legs slows down when you sit for long periods of time, which causes fluid to pool in the legs, swollen ankles and varicose veins. This can lead to blood clots. Sitting on an exercise ball or a backless stool to force your core muscles to work. Sit up straight and keep your feet flat on the floor in front of you. Walking during commercials when you’re watching TV. Even a snail-like pace of 1 mph would burn twice the calories of sitting, and more vigorous exercise would be even better. ← Top 5 ways to live past 50!